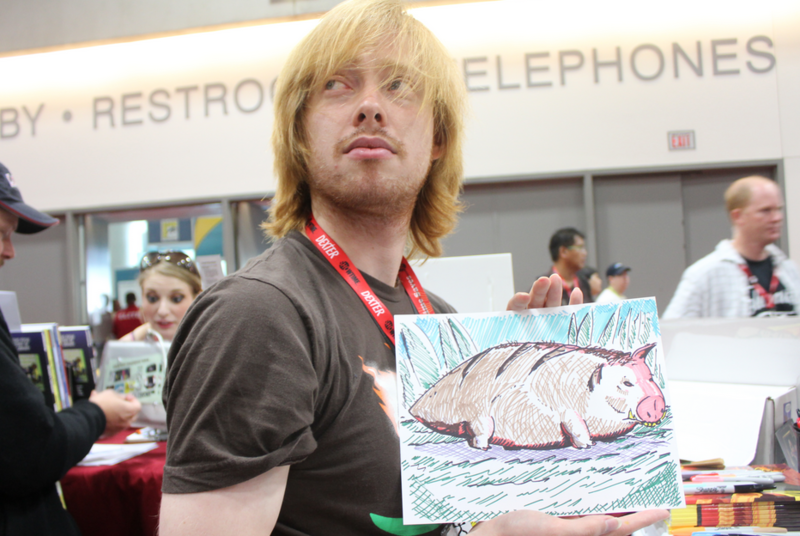 Science Cartoonist Series: The Zach Weinersmith Interview, Part One – AiPT! If you’ve traveled the series of tubes known as the internet at any point in the 21st century, you’ve probably seen a comic by Zach Weinersmith. He’s best known for Saturday Morning Breakfast Cereal (SMBC), which has an archive of over 3,000 strips ranging from traditional three-panel comics to more experimental presentations, but he’s also collaborated on other projects over the last 15 years, such as Snowflakes and Captain Stupendous. SMBC covers a breadth of topics as eclectic as its creator, but it’s known to many as primarily a science comic, and a compilation of the best such strips, Science: Ruining Everything Since 1543, was published in 2014. An obvious science and skepticism enthusiast, Weinersmith gave a keynote talk to the James Randi Educational Foundation’s Amaz!ng Meeting in July of this year, and AiPT! was there to find out how he made cartooning a profession, what he likes about skepticism and just what the heck BAHFest! is. Here is part one of that interview. AiPT! : How did you get started doing comics? Weinersmith: I started in high school, in the late 1990s. I was just doing it for friends, and I kind of quit on and off during college, and then I ended up working in Los Angeles for the film business, which was miserable. Well, I have friends in the film business, but they’re evil, too. I hated it, anyway, so I started doing comics again as sort of a way out. I don’t mean as like, a peace of mind thing, I thought maybe I could make enough money that I could physically not be there anymore. Somehow — it’s more complicated than this — but basically I was able to do that within a year or two, meaning I was literally making 800 or a thousand dollars a month, eating, like, lentils and stuff. But it was — I remember being really happy, so I don’t have any sort of … you know. AiPT! : Your comics have gone through a lot of changes over the years. What spurred all that? Weinersmith: I don’t know. I actually feel really weird about it. It always amazes me, now that I meet someone, and they’re like, “I’ve been reading your comic for 10 years.” And I’m like, “I don’t know how!” Because they’re not the same. I guess part of the appeal of the comic is — I don’t know of any other comic that’s quite like this. It’s literally about anything. For me, that’s neat, because I like to read about anything, and so it’s kind of like, whatever I’m into lately goes into the comic. Sometimes that’s topical … but sometimes that’s also stylistic — like I’m enjoying more storytelling than joke stuff, or more poignant stuff than humorous stuff. I can do that, and no one seems to mind. AiPT! : But there is — science does make its way into the comics. You’ve got the book out now — how did you get interested in science, in general? Your first degree was in literature. I came into a little money, it would have been in 2005, because I was in an apartment building that got bought out [and] demolished. They had to pay me a couple thousand bucks, which at the time was, like, infinite money. I was, like, 22; it was four or five thousand dollars. That was like, I had never imagined so much money. Now that I have a kid, that’s nothing. Anything short of infinity is not enough for raising a child. So I decided to quit my job and make a go of comics, and I just didn’t immediately make enough money. Part of the issue was, I was kind of like in a no-stress environment. I was single, I was having fun, and I just had to do one comic every day, which is just relatively easy, and I thought the writing really suffered. It was just too nice, so I remember thinking at the time that I needed a more stressful environment to do good work. It amazes me in retrospect — my longtime manager actually told me, he said, “I don’t think your work’s as good because you’re not as stressed as you used to be.” He was right, he was absolutely right. AiPT! : Is that something you were interested in before? Weinersmith: Not really. I remember the process for me … I remember thinking to myself one day, I had no idea how DNA works. It’s amazing that DNA works. There’s a quaternary code that makes things happen in your body; that’s so bizarre. And I couldn’t imagine it, so I was like, “Well, I’ll just read about it and learn it.” It turns out, you can’t just read about it, you have to learn, like, 800 things on the way there, and it got to where I was buying textbooks, and I was like, “Maybe I should just go back to college. This sounds like a lot of fun.” And I just kind of kept going. And then, for whatever reason, physics was just interesting, and also, what was nice, even in a state school, the kind of people getting physics degrees are relatively elite, which means the conversations are interesting. That sounds really snotty, but that’s how I felt about it. It was a fun group, so I just got sidetracked there, and then, for better or worse, about halfway through, comics were actually making real money and I had to quit to run the business. But I still study everything. Check out part two of The Zach Weinersmith Interview next week for talk about censorship, curmudgeonliness and and hyper-fast refrigerators!